Wow, I haven't done a Monday Reads post in a month! Yikes! But I did take a trip to Europe so... excuses. THE FILL-IN BOYFRIEND by Kasie West. Loved loved loved this book! So cute and fun, like all of her books. I highly recommend Kasie West to anyone looking for cute, clean YA reads with quirky characters and great dialogue. BIG MAGIC: CREATIVE LIVING BEYOND FEAR by Elizabeth Gilbert. I'm not much for non-fiction but I received this book from my ex-agent as a Christmas gift and of course gave it a try. I ended up loving it! I didn't agree with quite everything Gilbert said, but it was an inspiring book about learning how to live a creative life. It's probably one I'll pick up again when I'm feeling low on creative juices. THE PAINTED GIRLS by Cathy Marie Buchanan. I don't usually buy books I haven't read, or haven't heard good things about, or where I'm not familiar with the author, but this book was an exception. The blurb sounded right up my alley. While I did like the book, I didn't love it like I thought it would. I think because the book was darker/harsher than I expected it to be. Still a well-written and well-researched read though. PRIDE, PREJUDICE AND THE PERFECT MATCH by Marilyn Brant. I love PRIDE & PREJUDICE retellings, especially moderns, and this one was excellent. Great characters, great twist on the original, and a lovely ending. I'll definitely be picking up another book by Marilyn Brant! CROOKED KINGDOM by Leigh Bardugo. This book is a sequel to SIX OF CROWS. I remember having a hard time getting into SIX OF CROWS but once I did, I loved it. 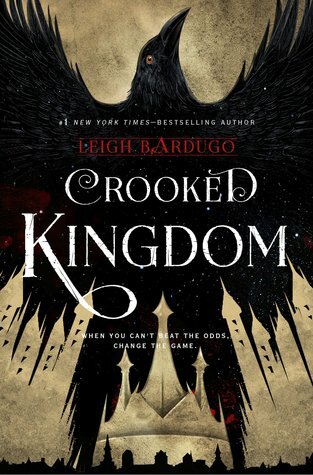 With CROOKED KINGDOM, I was into it from the very start- though I had a hard time remembering who was who and what had happened in the previous book. But no matter- it was an excellent read. Twisty plot and fantastic characters. DREAMING ANASTASIA by Joy Preble. So my Goodreads To-Read list is endless, of course, but I've been trying to read some of the books I added at the very start. This book was one of those. I couldn't even remember what it was about or why I added it, but I reserved it from my library and then dove right in when I got it. And, oh hey, it was about Anastasia Romanov, cool! Lol. This book ended up sorta like CLOCKWISE for me. There were things I loved but it fell a little short. Bummer. So that's basically my May reading. Can't wait to see what June brings!